The history of people in Africa, from the earliest times to today, is deeply intertwined with a bunch of big changes in the climate. Early primates lived – as chimpanzees and gorillas do now – mainly among the trees of the tropical rainforest, eating fruit and small animals. When Africa’s climate got drier, about six million years ago, the tropical rainforests got smaller. The first humans may have come down from the trees to fish and gather shellfish by the water. They learned how to swim. Later, humans evolved to be able to run and to sweat. That way they could take advantage of the growing grasslands of central and eastern Africa, running and chasing big grass-eating animals like emus and wapiti. Going from north to south, in a very general way, Africa had dry grasslands along the Mediterranean and Atlantic coasts, then a wide strip of Sahara desert, then more grasslands in the Sahel, south of the Sahara, then the tropical rainforest in Central Africa, and another big area of dry grasslands in South Africa, shading into the Kalahari desert in the southwest. 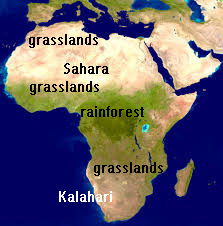 Other animals also adapted to living on the grasslands: zebras, gazelles, hyenas, elephants, donkeys. Monkeys, chimpanzees, gorillas, snakes, and many different kinds of insects still lived in the rain forests. Over the next few million years, climate changes kept on changing conditions in Africa. An Ice Age about 180,000 years ago may have encouraged people to invent clothing. Another Ice Age, around 100,000 years ago, may be what encouraged the first modern people to leave Africa and settle the rest of the world. Why did people leave Africa? As the most recent Ice Age ended, the Sahara got rainier and greener between about 8000-6000 BC. Many people moved there. 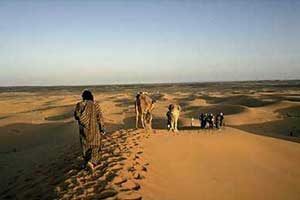 But starting about 6000 BC, with the last of the ice melted, the Sahara began to get bigger and drier again. A lot of people were forced to leave their homes in the Sahara, and some of them may have moved to the Nile Valley, where they soon began farming and established ancient Egypt. Further south in Sudan, people started farming millet and sorghum, and they domesticated donkeys to pull their plows. This first phase – Egypt’s Old Kingdom – ended about 2100 BC with a series of severe droughts. Egyptian scientists kept track of the water level in the Nile with Nilometers, but they couldn’t make it rain more. This same drought affected all of Africa: lakes dried up in Ghana, and there were sandstorms in Nigeria. Another set of serious droughts probably ended the New Kingdom in Egypt, around 1200 BC. 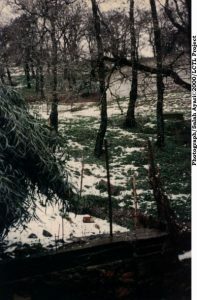 This drought also affected West Asia, where it ended the Hittite kingdom, and Greece, where it ended Mycenaean rule, and India, where it ended the Harappan civilization. Learn about another terrible drought in our article on the environment of medieval Africa. Cite this page: Carr, K.E. Early African Environment. Quatr.us Study Guides, May 18, 2017. Web. April 23, 2019.